Isaac married Sara Wittla Blum, the daughter of Munisch Blum and Mirl Amkraut of Rzeszow. in the photo above, which may have been taken around 1908, they are standing in the garden of their mansion on Skotnikca Street. The house, which Isaac's niece's daughter remembers, was "a little palace" is seen to the right as it was in 2009. Right: Mira Feuerstein Kronstein with her children, Helene and Jacob. This portrait was taken in Baden near Vienna, probably while the family lived in Austria during the First World War. This photograph of Mira's children was taken in Stryj after the family returned from Vienna. Mira and Henryk had two children, Helene (Hinde) (1909-1993) and Jacob (1911-1997). Mira Kronstein, right,her daughter Helene and son-in-law Henryk Schatzker at a spa. 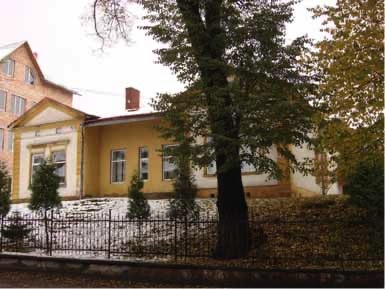 In 1939, when the Soviets occupied the eastern part of Galicia under the Treaty of Brest-Litovsk, the properties of the Kronstein and Feuerstein families in Lubience were confiscated. Under the German occupation, the great manor house on the Gartenberg estate in Lubience, where the Mira and her husband lived, was destroyed. The local peasants burned down the new home of Henryk's daughter Helene. The family moved to Stryj. After the first Aktion, Mira and Henryk, along with their widowed daughter, Helene, her son Joseph, and their son Jakob and his wife Bella escaped to Warsaw where they hid using false papers. In Warsaw they lived in constant fear and were constantly preyed upon by blackmailers. Mira died on January 15, 1944 of an acute internal hemmorage. In normal circumstances, she would have survived with medical treatment. However, seeking medical care might have risked revealing the family's identity and hiding place. Henryk Kronstein was taken by blackmailers in July, 1944, just before the Warsaw Uprising because he was too old to crawl into the hole under the floor where his daughter Helene and her son Joseph hid from danger. Above: Isaac and Sara are seen with with their five children: from left to right: Eliakim David (Lucio) (1891-1942), Moses Tewel (1893-1942? ), Sara Amkraut-Feuerstein (1863-1942? ), Mirl/Mira (1887-1944), her husband Henryk (Hersch) Kronstein (1882-1944), Isaac Feuerstein, Chaim (1892-1942? ), and Meilech (Max) 1896-1942?). Of the couple's four sons, only Chaim married. His wife was a woman of Drohobycz, possibly with the surname Hecht. They had one daughter. All the people in this photograph perished in the Holocaust, along with Chaim's wife and daughter. Isaac Feuerstein (1862-1942? ), a wealthy lumber merchant and property owner, came from a family with deep roots in Drohobycz. He was the great grandson of Mordecai Sternbach, a grain dealer, and his wife Chaye Tille. The Sternbachs were among the leading families of Drohobycz, whose members served as heads of the kehila for many decades. (see The Sternbach Family). Isaac's grandfather, Eliakim David Feuerstein (1810-1872) who was a distiller, married Mordecai's daughter, Pessel Sternbach (1806-1881). Isaac was related to and allied with other petroleum magnates,such as the Gartenbergs. Indeed, the wood industry in the forests of the Carpathian foothills, thrived during the early years of the petroleum industry because large supplies of wood were needed to construct shafts, buildngs, and derricks. During World War I, when the Russians were about to invade the Drohobycz district , Henryk Kronstein loaded his family on a large horse-drawn cart and fled across the Hungarian border. From there, they were able to take a train to Vienna. The Kronsteins spent some of the war years in Vienna, like many thousands of Jews who fled the atrocities of the Russian invaders, especially the Cossack troops who were particularly cruel in their treatment of Jews, . Mira Feuerstein, the only daughter of Isaac and Sara Feuerstein married the son of her father's paternal aunt Hinde Feuerstein, Henryk Kronstein (1882-1944). He was born in Zurawno. Mira and Henryk lived in the manor house on the Gartenberg estate in Lubience. Henryk managed the estate for Adele Gartenberg, the widow of his cousin Jacob Feuerstein. Henryk also ran his own large, successful lumber business from Lubience. Mira hosted the local gentry in hunting parties, visited Lemberg frequently, and traveled to Vienna about twice a year to go to the opera, the theatre, and seek medical advice from the professors of medicine at the University of Vienna. The family took frequent holidays in local spas like Krynica. Above: In 939, just before their world collapsed, we see Mira as a grandmother with her family in Morszyn, a spa. From left to right Mira's grandson Joseph Schatzker, her daughter Helene, her son-in-law, Henryk Schatzker, Joseph's governess Teta, (Aniela Kazimierowicz), Mira, and Joseph's playmate from Lubience, the stationmaster's daughter, Krzysia. In 1933, Helene Kronsten married Henryk Schatzker, a forestry engineer and major in the Polish Army, who had been born in Schodnica, where his father Joseph worked for the railway. Henryk had come to work in Helene's father's lumber business in Lubience. Jacob (Kuba) Kronstein married Bella Zeisler of Stryj shorty after the outbreak of the Second World War. 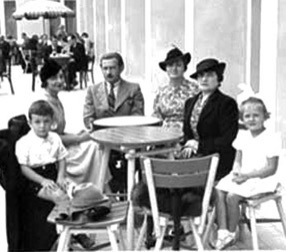 Back row, left to right: Charlotte Kronstein, Henryk's son, Jacob Kronstein, Pessel/Pepi Kronstein Haas, and her daughter, Henrietta/Hela Haas. Front row, left to right: Henryk's daughter, Helene, Henryk Kronstein, Mira Feuerstein Kronstein, Joseph Haas. Charlotte and her husband Adolf, who is not seen here, had no children. 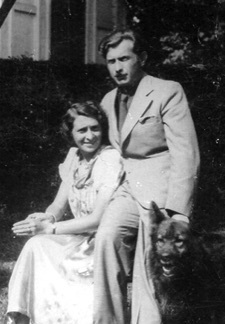 They, Pessel and her husband Joseph Haas, their daughter Bella (Berta) (not shown here), as well as Mira and Henryk Kronstein, all perished in the Holocaust. While the family was in the Stryj area until late 1942, Joseph Schatker's governess, Aniela Kazimierowicz, one of the righteous Gentiles, helped them to survive. Many of the photographs shown here had been hers. Aniela gave them to Mira's daughter Helene after the war. Submitted by Dr Joseph Schatzker. Mira Feuerstein's daughrer Helene and her husband Henryk Schatzker, a forestry engineer, born in Schodnica. Four days after the Nazi armies occupied Stryj at rhe end of June 1941, they took ten men, Henryk among them to Duliby, outside the town. They were forced to dig their own graves and were shot into them.